The Trainer Profit Investor Software Elite Program! A Remarkable Handicapping Profit Mechanism that Focuses on one of the most critically important parts of the game – The TRAINER! Instantly Spots Positive ROI Situations – Plus, features ‘Sneaky Trainer Profit Angle’ Locator – one of the most POTENT Price-Play Angles Ever Developed. OK, here’s a total No-Brainer, must-have, totally-efficient, profit-producing piece of software any horseplayer who is serious about this game should own. 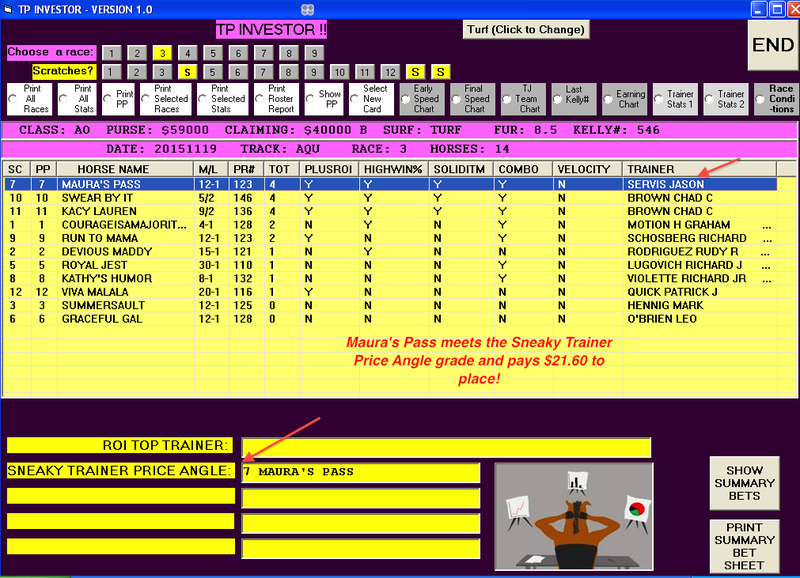 You will now have the ability to INSTANTLY know which Trainer(s) boast Positive Returns on Investment in any given race. 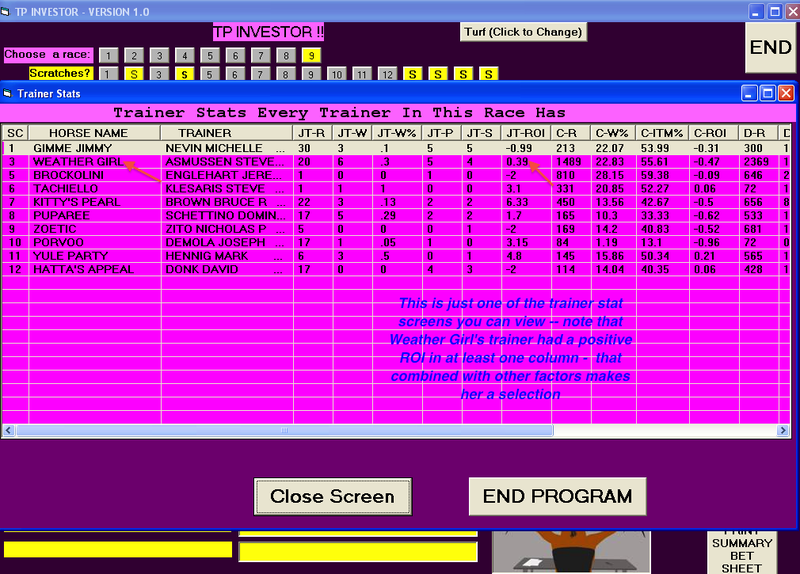 >>>You see, the TPI Software KNOWS which Trainers have shown a winning advantage in a situation(s) that apply to today’s race. 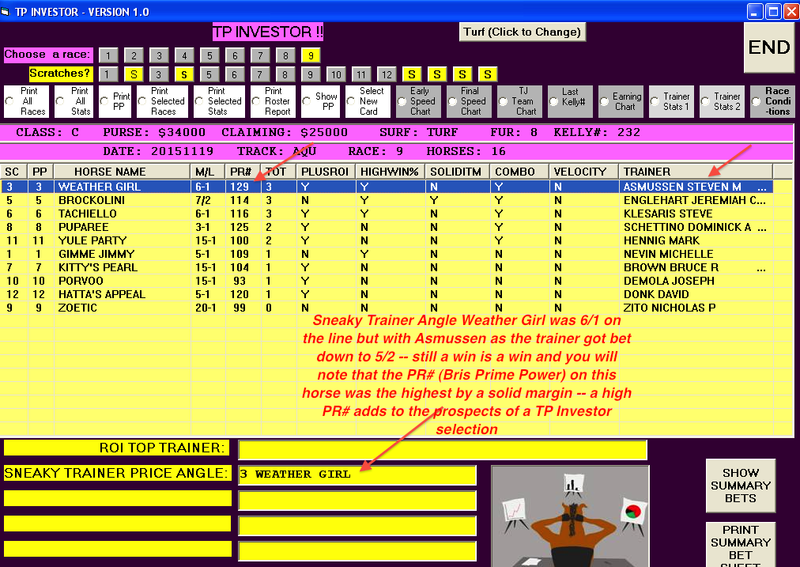 >>>If, for example, today’s race is a turf race and a horse’s previous race was on the dirt AND the Trainer has shown a positive ROI with this move in the past, the TPI Program will alert you to this fact. >>>If the Trainer has more than one Positive ROI Situation, you will know that, too, and, obviously, the more Positive ROI Situations a Trainer has, the more likely it is that his horse will run big. A solid wagering opportunity whenever a situation like the one below comes up. When TPI picks are ‘bet-down’ significantly from the morning line, the win/place % is high – @59%. 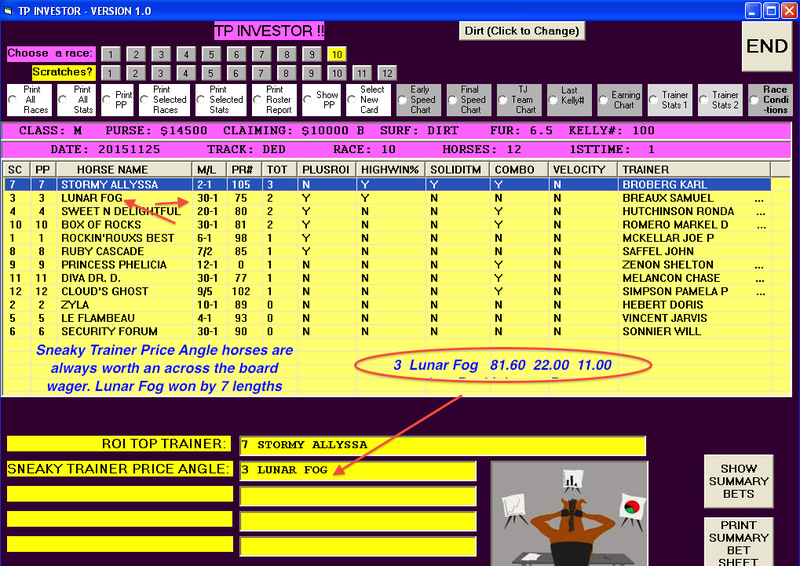 TPI works at ALL tracks, but overall you will likely get your biggest Sneaky Trainer Price Angle plays at class B and C tracks — a perfect example is Lunar Fog below, who romped by 7 lengths at 41-to-1! Below view the ‘treasure trove’ of Trainer stats that you can view in the program — these stat/data computations, along with dozens of others programmed into the software by Len, is the foundation of TPI’s discovery/selection process. >>>>>All of TPI’s stats are updated daily, so when you download the brisnet.com data file, you will have all the most recent Trainer data available. It provides the player with information that only a tiny, tiny percentage of players possess — information that will result in higher average mutuels and more frequent visits to the cashier’s window for you. 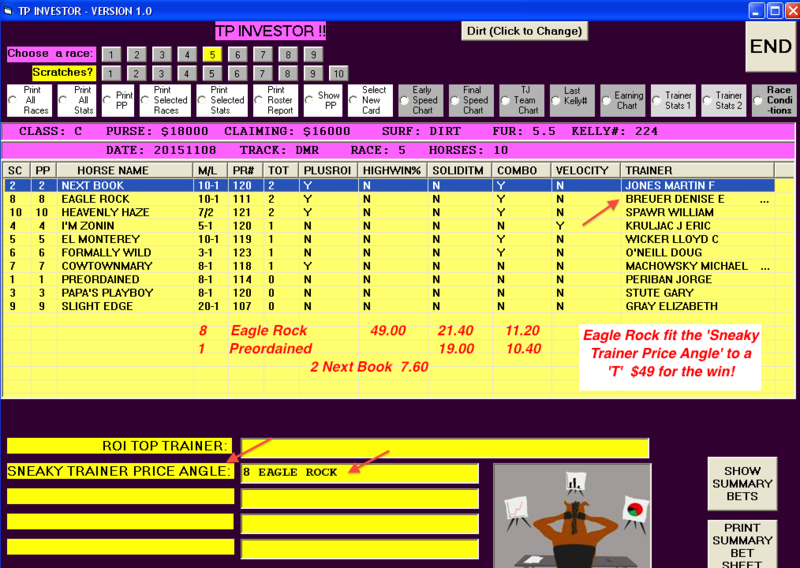 The Trainer Profit Investor Software Elite is a superb selection tool, as well as a research tool. >>>>And it is being offered at a superb price, less than a C-Note — just $97.90! TPI/Continuum Combo – just $177.50!